Arsenal 0-2 Liverpool- Things just keep getting worse for the Gunners, and in particular high cost fantasy players like Robin Van Persie. Anyone who splashed out on the Dutchman – hoping for instant gratification I presume – will find themselves now well behind the pace, though of course, it’s still early days. On the other hand, Luis Suarez has enjoyed an excellent start to the season, two goals so far and an assist here to boot. Liverpool’s defense also deserves some credit, with low price players like John Flanagan emerging as useful fantasy weapons. 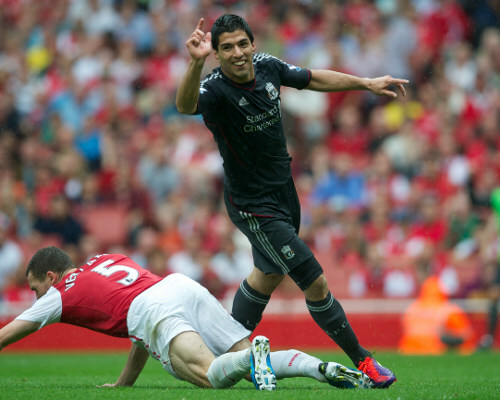 MOTM: Luis Suarez- Goal, and brilliant twenty minute cameo. FOTM: Emmanuel Frimpong- Great performance, but sent off in the second half. Aston Villa 3-1 Blackburn- I tipped Villa to do well this season, and thus far they have made good on that prediction. Fairly solid at the back and dangerous up front, a Europa League push might not be out of the question. The top performers were obviously in attack for Villa, with Bent, Heskey and Agbonlahor starring. By the same token though, Blackburn’s defenders did not perform at all well, and have now conceded five in two matches. MOTM: Gabriel Agbonlahor- Goal, assist and cheaper than Bent. FOTM: Ryan Nelsen- Could have been any Blackburn defender, but Nelsen is the most popular fantasy pick. Chelsea 2-1 West Brom- A lucky escape for Chelsea, who haven’t looked very impressive during this opening stretch. Florent Malouda’s goal from midfield headlines the attacking point scorers, while Shane Long is fast becoming one of the league’s best value for money signings. Mid week I wrote about the importance of avoiding Chelsea’s strikers, and that analysis was vindicated by another line-up involving only one center forward. MOTM: Florent Malouda- Goal from midfield. FOTM: Jonas Ollson- Two conceded, and a yellow card. Coin flip between him and Gabriel Tamas. Everton 0-1 QPR- I guess, it was only to be expected. Tommy Smith’s first half goal consigned Everton to yet another disappointing opening day showing. MOTM: Tommy Smith- Goal, and no one else matched that. FOTM: Leon Osman- The only Everton player to be booked. Sunderland 0-1 Newcastle- A goal and clean sheet from Ryan Taylor was the only real fantasy headline, though Phil Bardsley’s sending off provided some managers with a cause for concern. MOTM: Ryan Taylor- Goal, clean sheet, great value for money. FOTM: Phil Bardsley- Easy, a sending off and no clean sheet. Swansea 0-0 Wigan- Defenses on top here, as two sides who like to move the ball on the floor played out a 0-0 draw. Missing a penalty, Ben Watson emerges as the game’s one loser, while the defensive ability demonstrated by both back fours makes for some uncharacteristically high point scorers. MOTM: Michel Vorm- Clean sheet and a penalty save – was impressive against Manchester City too. FOTM: Ben Watson- A penalty miss.